If you support Donald Trump you can spend the rest of your life saying you voted for the candidate supported by the Ku Klux Klan, white nationalists, and Nazis. Yay you. Trump has had trouble attracting endorsements in the general election from newspapers. He’s gotten a few tiny dailies and one major, The Las Vegas Review-Journal, owned by notable billionaire and Republican sugar daddy Sheldon Adelson (disclaimer: The Review-Journal is one of my clients), and will probably receive one from his son-in-law’s newspaper, The New York Observer (another client of my cartoons. Weird huh?). He’s also received an endorsement from the National Enquirer which might help with the uneducated housewives in grocery store lines. 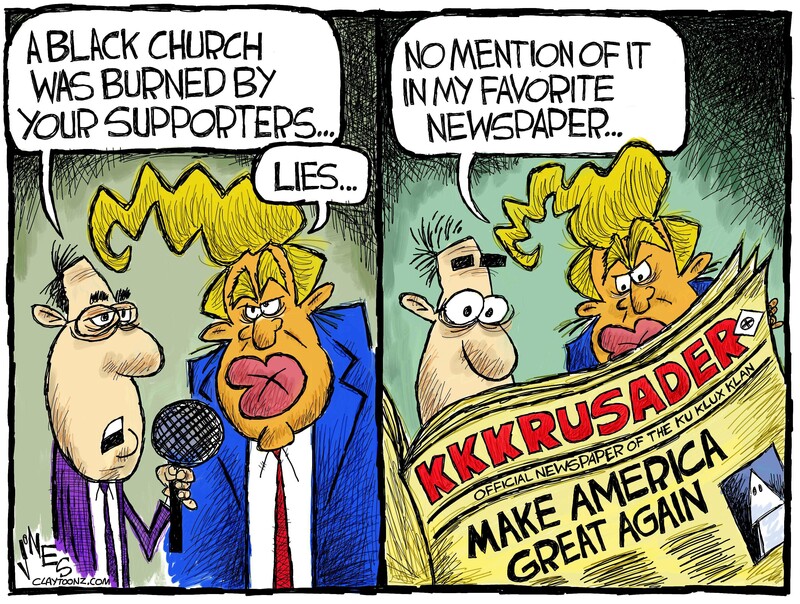 The endorsement that made the most news this week is the one he received from The Crusader (NOT one of my clients), the official newspaper of the KKK. How white of them. It’s so embarrassing it makes Trump want to hide his face under a paper bag, or in this case, a sheet. The Crusader says it’s not an “official” endorsement and that Trump just embodies all they stand for, like hating people who are not white. I’m not sure how they can say it’s not an endorsement since it took up their entire front page under the headline “make America great again.” Gee, where have we heard that slogan? Did I mention it took up the entire front page? There wasn’t even room for a mayonnaise ad. The Trump campaign says they don’t want the endorsement, though they stopped short of saying they don’t want racists voting for them. They also said the Crusader doesn’t represent the views of their millions of followers, you know those people. They’re the ones shouting “Jew. S. A.” at Trump rallies. Earlier in the week a black church in Greenville, Mississippi was burned and vandalized by spray paint with the words “vote Trump.” No word yet from the Trump campaign on if they denounce the hate crime. Trump wants to distance himself from the racists but he doesn’t want to alienate them either. You dance with the one that brought you. Trump can’t claim pure innocence from the actions of his followers. He has encouraged the votes from the “uneducated” and has ran a racist campaign where he’s attacked Muslims, Mexicans, retweeted an anti-Semitic image, and once shouted at a rally “there’s my African American.” He was sued in the past, twice, by the Justice Department for refusing to rent to black people. His New Jersey casinos were fined for removing black card dealers if a racist gambler asked for them to be removed. Trump supporters, those with a conscience, need to ask themselves why Trump attracts people like David Duke and Nazis. They’re not coming for the xenophobia and staying for the crotch grabbing. Trump may say he loves “the blacks,” but the Klan loves him. On Tuesday I’ll be voting for the candidate who has not been endorsed by the Klan. My conscience can live with that.